Hi everybody, Erica here from 5 Little Monsters to share another Geek Craft with you today. I am actually posting this as part of the Happy Harry Potter Series that Marissa from Rae Gun Ramblings does each July in celebration of Harry Potter’s birthday. 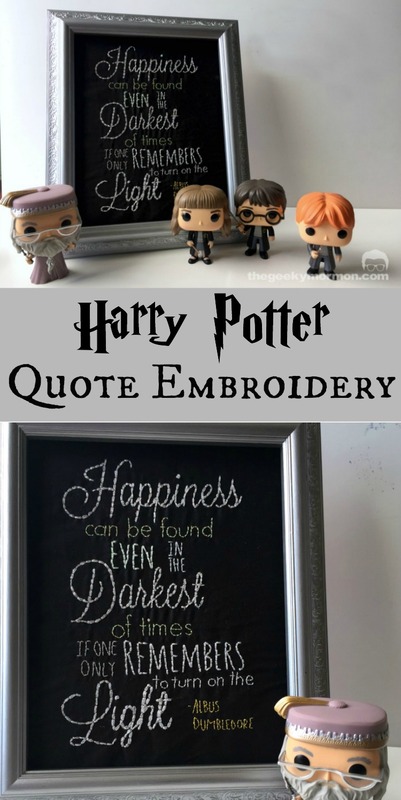 Be sure to go check it out because you will find tons of craft ideas, recipes, and other posts from lots of different bloggers, all Harry Potter related. There are even a couple of giveaways. The series runs for a couple weeks and I will be sharing another Harry Potter project over on 5 Little Monsters next week. 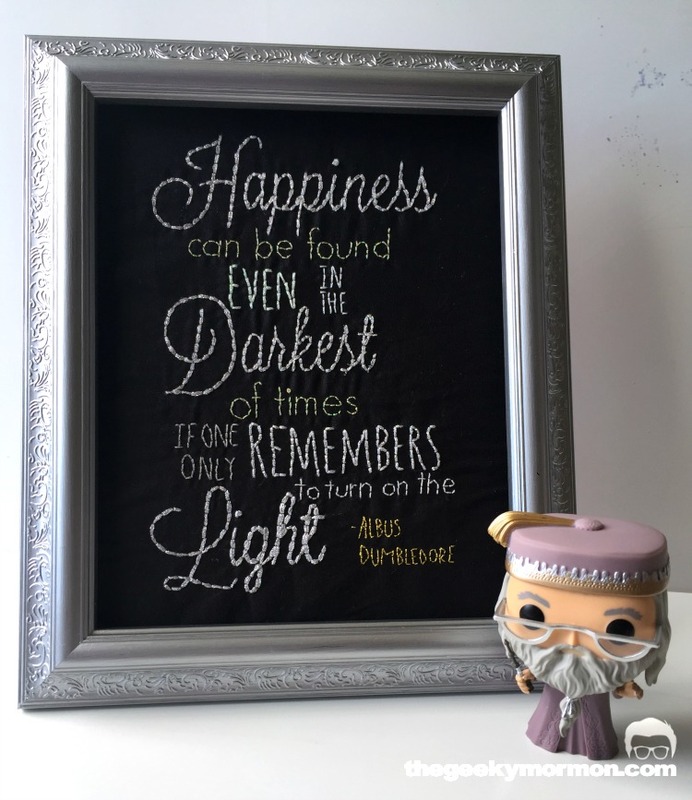 For today’s post I decided to make an embroidery of a quote that Dumbledore said in the third movie. I was actually a little bit disappointed when I looked it up and realized that it is not ever said in the books. 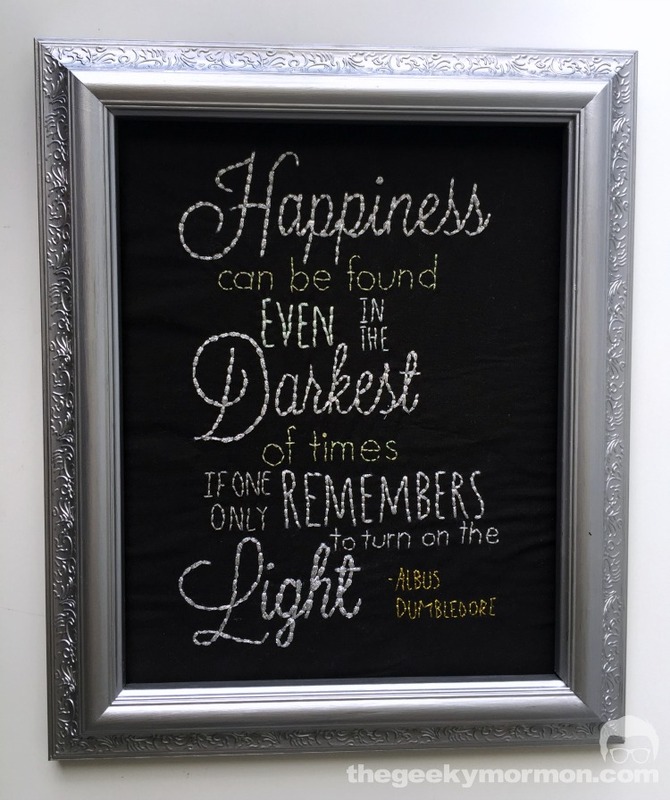 It is probably one of the more popular quotes so I’m sure most people have heard it and seen printable versions of it but I decided that I wanted to make my own version. I decided that I wanted to embroider it and not too long ago I got some thread in the mail from a company called Kreinik. They sent me their bag o’ bits, which is a bag full of little pieces of thread. Some of them were pretty short but there were plenty of nice long ones too. All of the thread was metallic and there were different colors and weights. Some of them were kind of flat and ribbony, others more cordlike. As I was looking through the bag I decided that those threads would be perfect for this project. 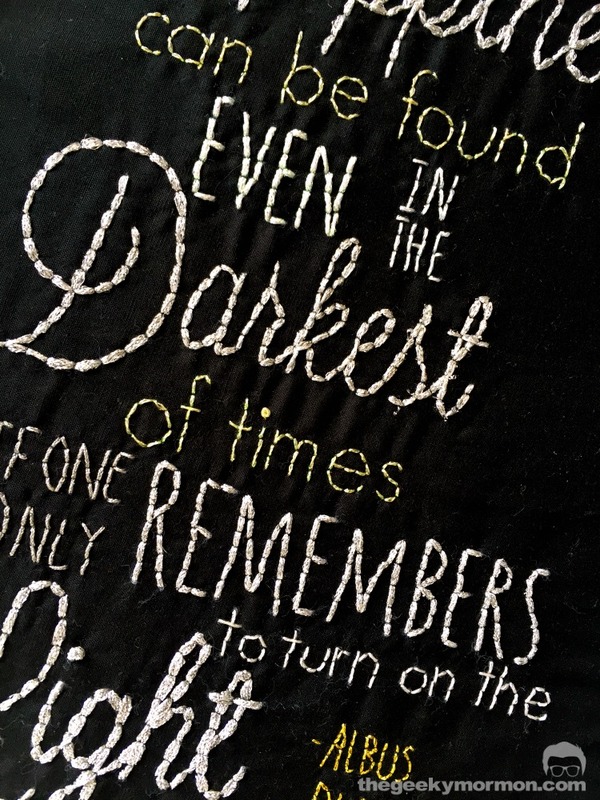 I decided to embroider the quote on black fabric to represent the darkness part of the quote. Then the embroidery was done with various metallic threads. I thought the the shininess and sparkle of the metallic threads would represent the light part well. In the pictures it is a little hard to see the shininess of the threads but they are shiny in real life. On the bigger words I used the heavier weight threads and for the smaller words I chose lighter weight threads. I chose mostly shades of silver and white with a little bit of yellow and gold. I wanted colors that would reflect that sense of light. The first thing you will need to do is print out your pattern. I was worried that tracing the pattern onto the black fabric would be difficult because of how dark the fabric was but it ended up that with the fabric I used it wasn’t too bad. I first taped the pattern onto a window. Then I taped the fabric on top of that. With the light from the window I was able to see through the dark fabric to the pattern. Trace the pattern with the white pencil. Next Iron on the fusible fleece to the back of your fabric. This helps stabilize the fabric as you are embroidering, especially if you are using heavy threads. Pick out which threads you are going to use for which section. I chose flat ribbon-like threads for the large cursive words, the larger block words I used a thicker cord-like thread and for the smaller words I chose smaller threads. Embroider the words using a backstitch. Once you are done you are ready to frame your piece. I just picked up a cheap frame from Walmart. It was originally brown but with a few coats of silver metallic craft paint it looked more like what I was wanting. 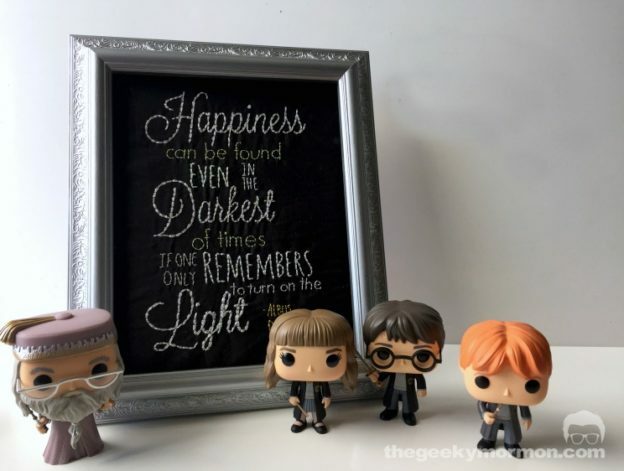 This entry was posted in Geek-Craft, Harry Potter, Uncategorized and tagged Geek-Craft, geeky crafts, Harry Potter on July 22, 2016 by Erica Dietz. I love the geeky embroidery! I will have to do this one!